The RH sling hook -- colour coded for capacity rating. GUNNEBO Lifting has launched a new sling hook, adapted for lifting using round slings or webbing slings. The new hook - RH for round sling hook - is produced as a single unit and the hook's special design means it cannot loosen by itself. The shape also protects the sling against wear when loading or when impacted. 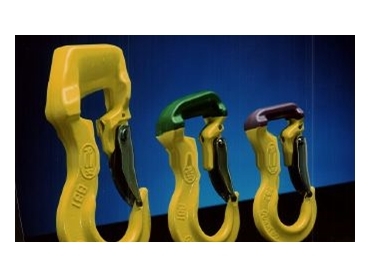 The hook is available in three different sizes with a working load limit of up three tonnes. The RH is included in Gunnebo's GrabiQ program for secure lifting. The new hook is adapted for lifting using round slings or webbing slings. Gunnebo RH is designed with flanges on the eye of the hook. This protects the sling when the hook and sling are dragged along the ground. The shape is also adapted so it does not accidentally snag onto other parts. The eye of the hook has an extra wide radius so it does not crush or damage the sling. It takes only a few seconds to change the RH hook from a worn sling to a new one. The RH hook can be re-fitted to a replacement sling saving a considerable amount of time. It can be locked onto the sling for added security. The hook is manufactured as a single unit in order to minimise the number of lifting components, thus reducing inspection time, and meets the requirements of the European standard in compliance with EN-1677.